Halloween isn’t just for kids anymore or at least it shouldn’t be. 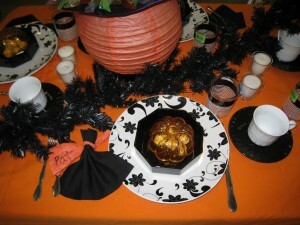 I presented several Halloween table setting ideas at the grand opening of a new Goodwill store last week. It’s amazing what you can ‘throw’ together on a budget! 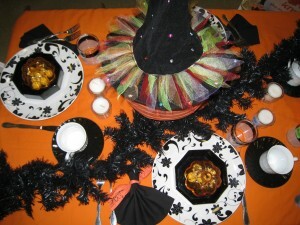 No tricks at this table! I started with a bright orange sheet. You can us anything for a table cloth. The white plates with the lovely black floral border would be perfect for any event, but are extra special for October 31. 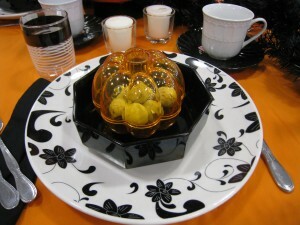 I paired them with 8-sided soup bowls, white cups and black saucers. Nothing is from the same set, but all look great together. Even the little juice glasses with black stripes were meant to be! Isn't Halloween all about the candy? 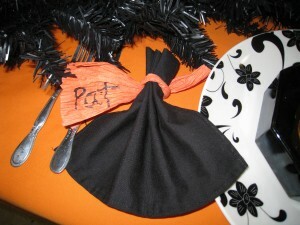 Use the pumpkin dishes filled with treats as party favors. Napkins are black (what else?) and tied with a bit of raffia. Un-twist it so you can write your guest’s name. Make an easy napkin ring with a twist of rafia. The contrast of the black garland across the table with white votive candles sets the right mood. 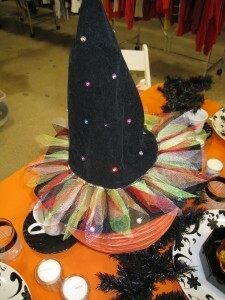 Instead of a traditional pumpkin, I chose an orange paper lantern,and topped it with a not-so-scary witch’s hat. 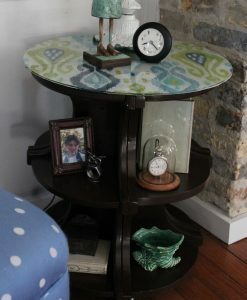 The whole table cost less than $30.00 and looks like a million bucks! A jack-o-lantern would be expected, a paper lantern is unique! love all the cute ideas you’ve shared! DIY Table from Corner Bookshelves!